When we planned our trip between San Diego and southwestern Utah, I was looking least forward to the trip between Vegas and St. George. Ok, let’s face it, I was dreading it. Even as a geologist, that stretch of road isn’t very interesting and it seemed we would be forced to ride a bunch of highway miles. Fortunately, on looking inspection, we were able to find what turned out to be a great route, and a spectacular Nevada state park to boot. 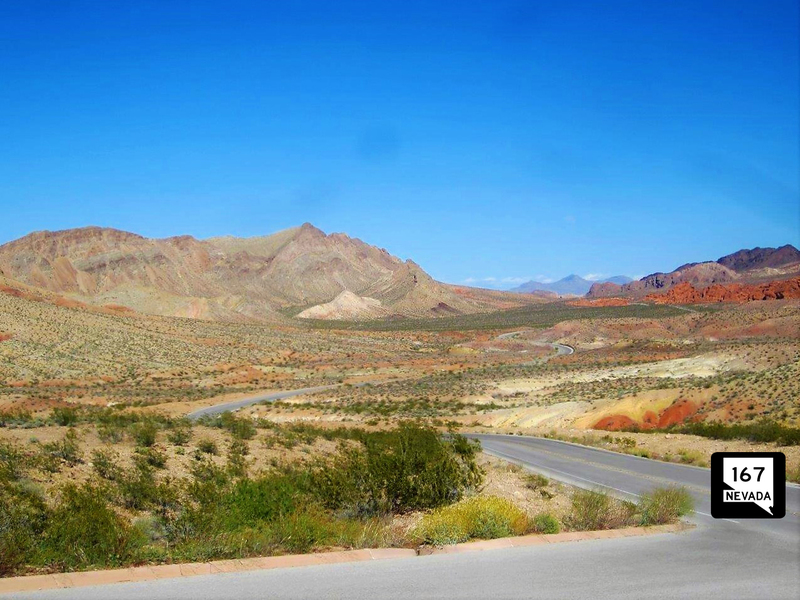 We discovered Highway 167 along Lake Mead and the Valley of Fire State Park. The main attraction of this highway is where the 167 becomes the 169. 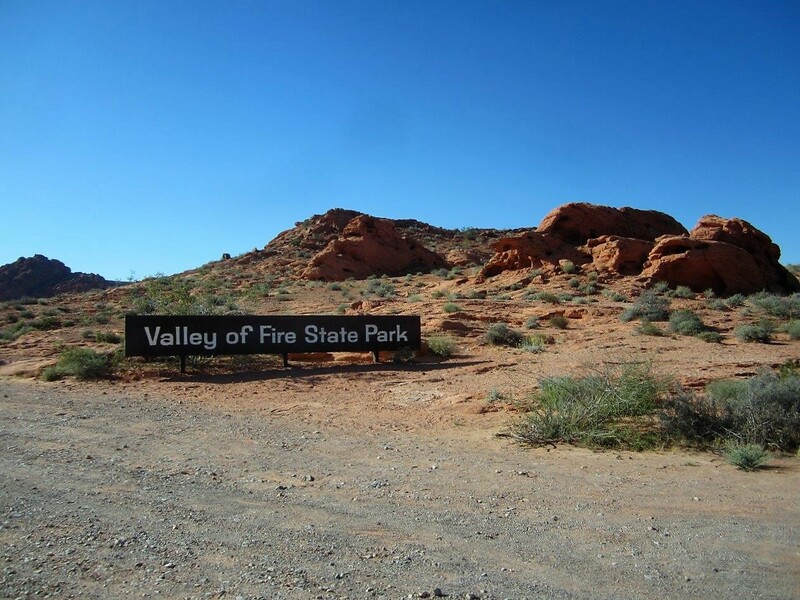 Where the two roads meet there is a turn off to Valley of Fire Highway. 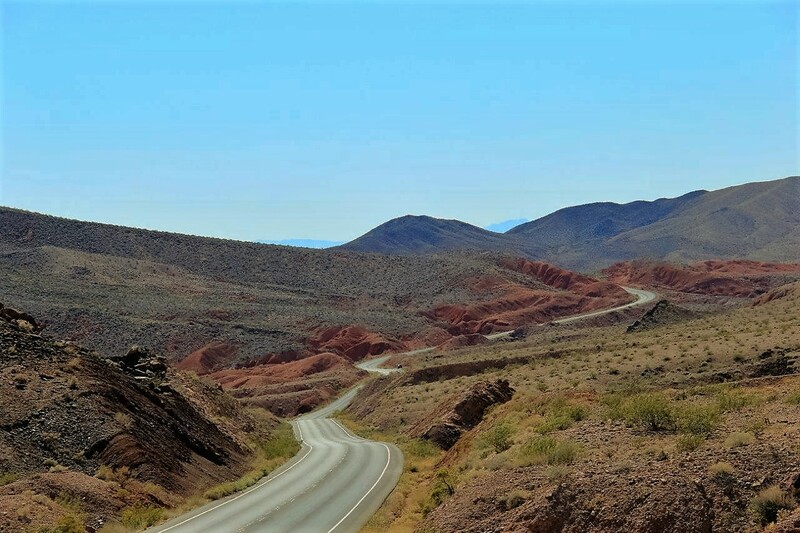 Like the 167, the Valley of Fire is also nothing like a highway in any sense of the word). 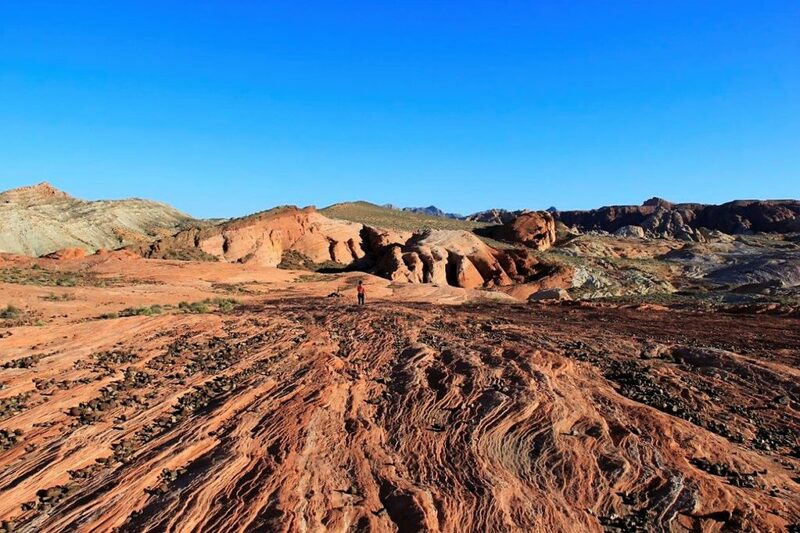 The Valley of Fire State Park is really a gem in this pretty desolate and unforgiving land. 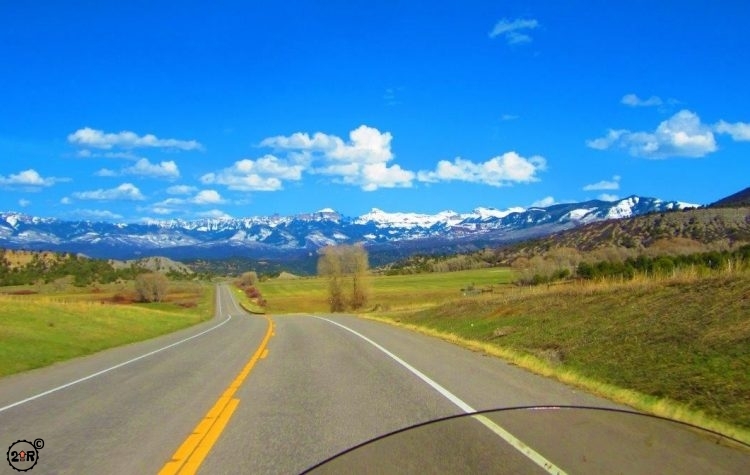 We entered from the east side and cruised our way down the well paved entrance road with ever more beautiful and wider expanses of the red rocks. From the visitors center, we looked at where we wanted to head to maximize the time we had in the park. 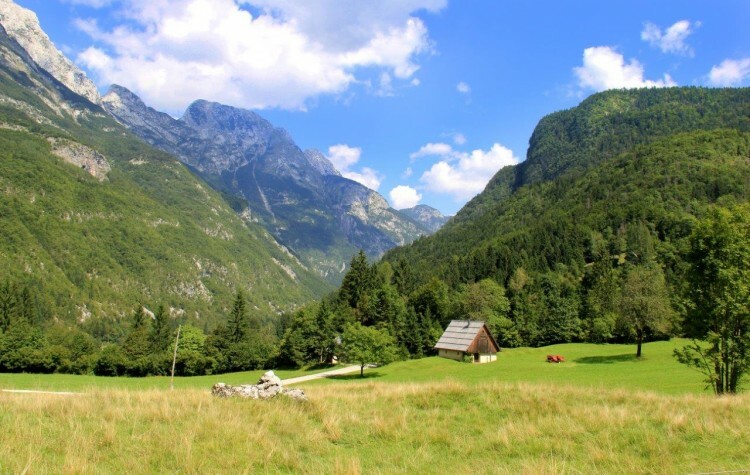 We drove up the narrow valley to the north to see a few great vistas and rock formations. 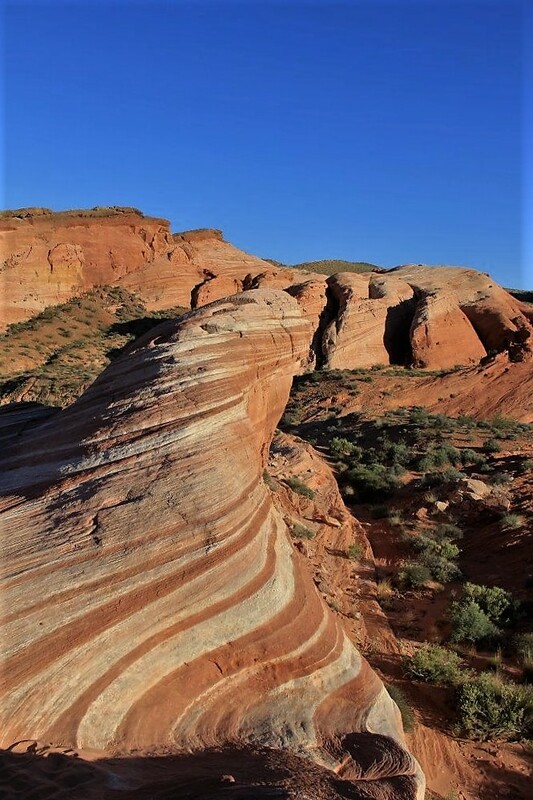 Once out of the valley, the view opened up to a broad expanse of red and white sandstone cliffs, hood doos, interesting rock formations. The view is known as Rainbow Vista and it certainly lived up to the name. We rode the scenic drive to the end and turned back around to check out the Fire Wave. 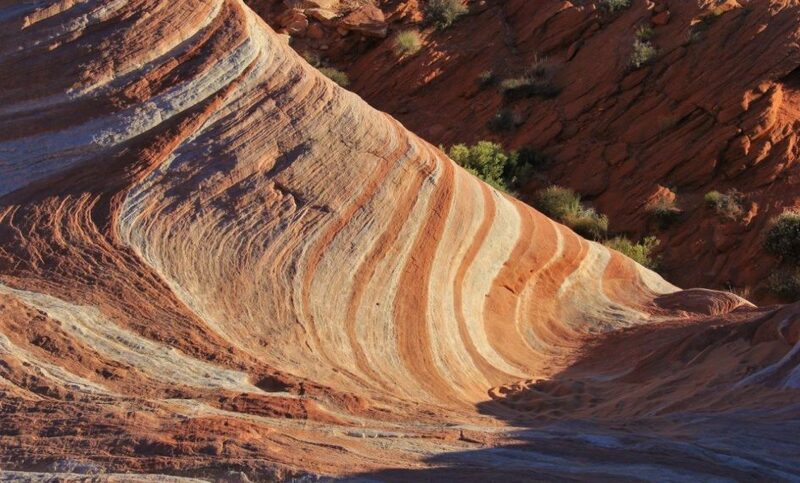 Similar to “The Wave” in Northern Arizona, the Fire Wave is a rock formation of sandstone that is 150 million year old sand dunes similar to those you would see in Zion, Arches, Kanab, and all over the desert southwest. 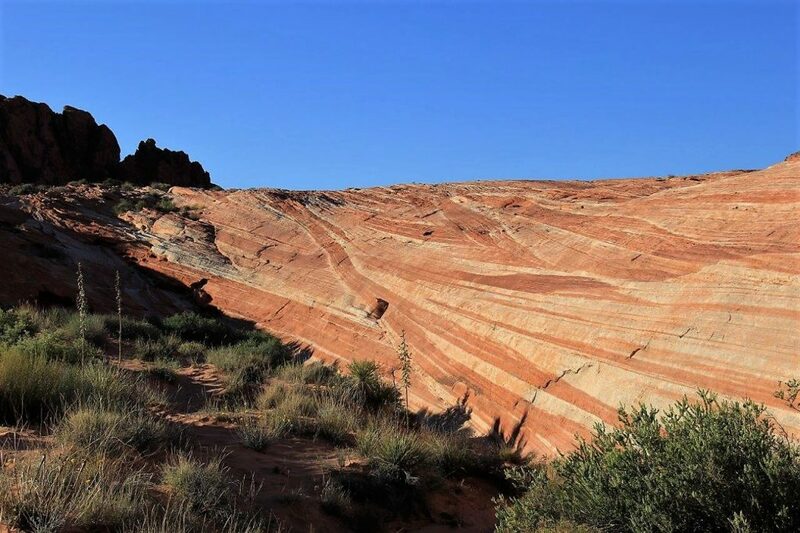 The sandstone has alternating layers of red, iron stained sand and bright white quartz sand. 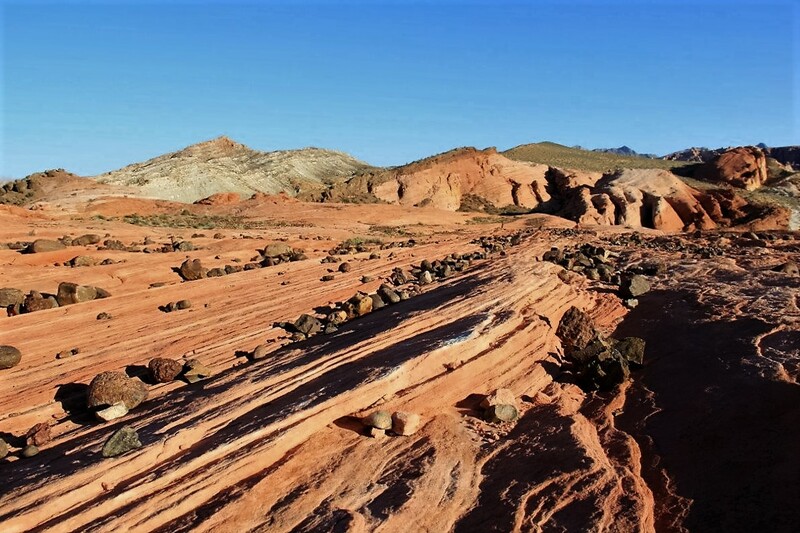 The entire hike out to the wave was really awesome with dramatic rock outcrops and erosional features, layers with ripples formed in a shallow sea when the dinosaurs roamed, thousands of fist size chert nodules eroded out of the rock that used to overlie the sandstone, and finally the Fire Wave. 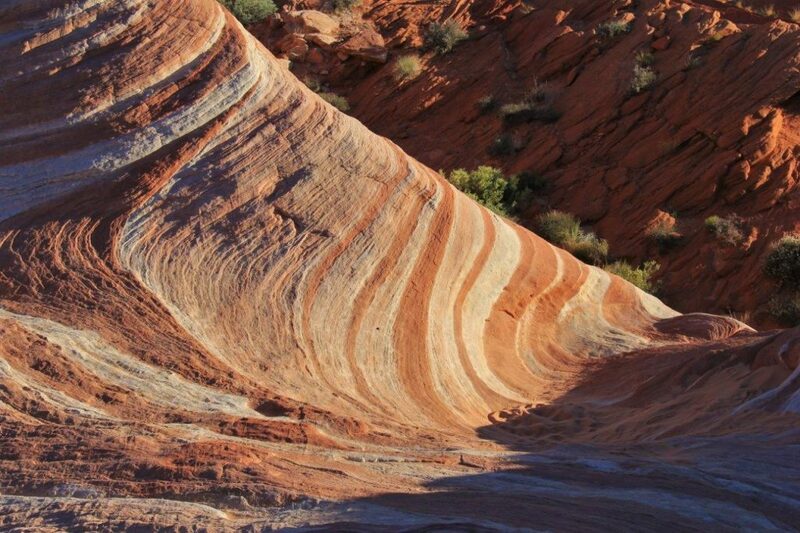 Even though the layers of sand are fairly uniform and straight, the curved erosional shapes formed from the centuries of wind and water beating against the rock have literally created what looks like a wave from the several vantage points. 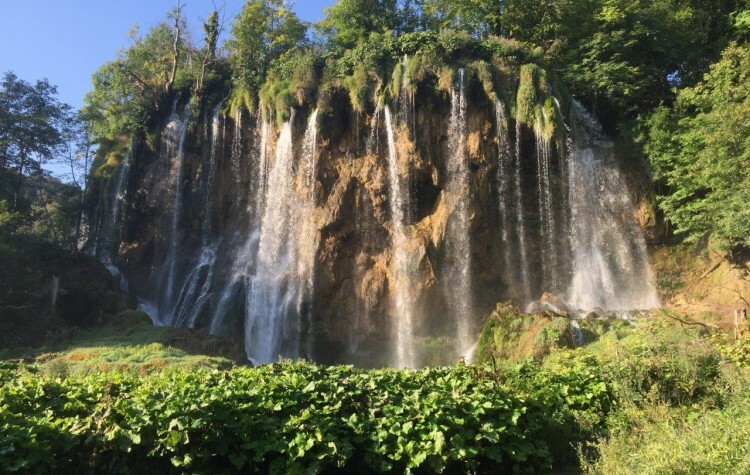 It’s truly an amazing sight to see and we were really fortunate to experience it at sunset when the light is most dramatic. 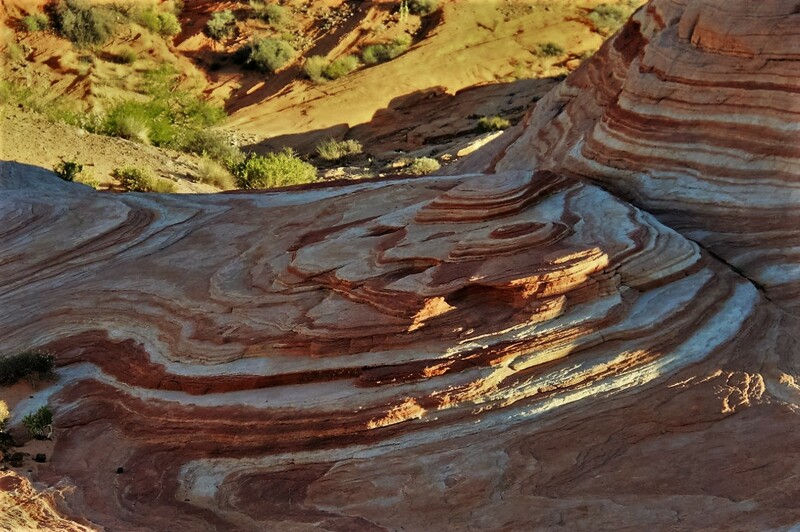 The Fire Wave was the star of the show, but there were many other dramatic views along the short hike. While at the park we were also able to see the Elephant Rock which really does look like an elephant (with some imagination of course). 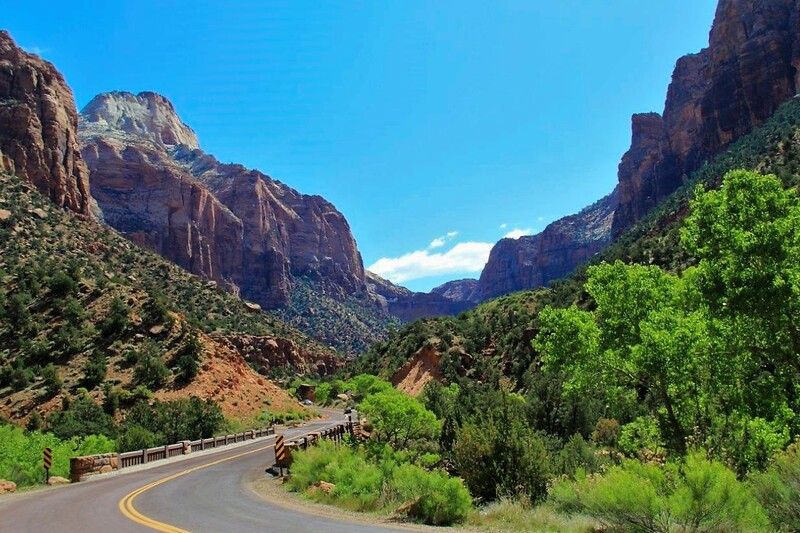 Several othr cool things to see are the Seven Sisters, Arch Rock, Atlatl Rock (petroglyphs), petrified logs, beehive rock formations, and Balanced Rock. To get a good dose of the park likely requires 2 to 3 days. The desert wildflowers and native shrubs were also in bloom and they provide a great measure of softness and beauty among the dry, harsh desert environment. It’s always amazing to me how the flowers and bushes survive through such intense heat and drought, then cold in winter, just to be able to bloom for less than a month’s time, and we get to enjoy it. We were able to see Indigo Bush, Desert Primrose, and Desert Mallow. The primrose is a pure white, the desert mallow is an amazing peach/orange, and the indigo bush is…well…indigo. 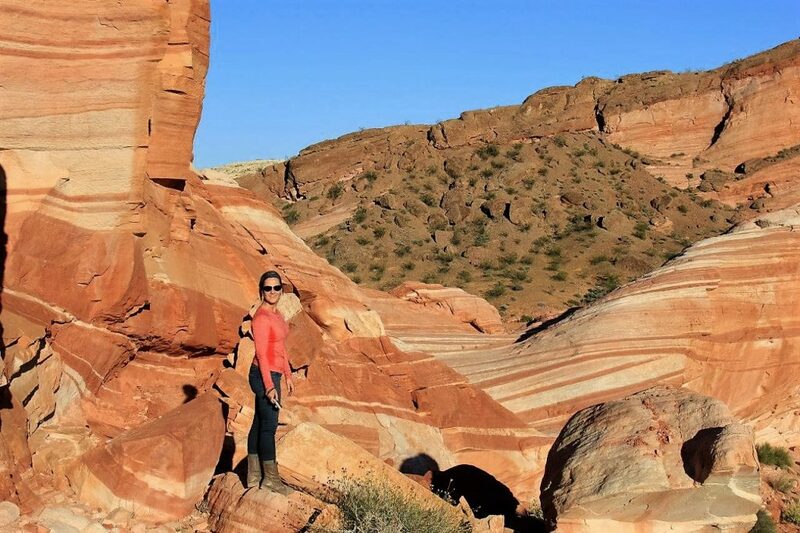 Make sure to get out and see this park if you in the area or need a break from the insanity that is Las Vegas. We’ll be sure to return!